This library was influenced and inspired by existing projects like: React, virtual-dom, bel, and yo-yo. Disclaimer: Before deciding for or against this tool, look into these libraries first. They have vibrant communities to help you when you inevitably get stuck or have a question. With diffHTML you'll have a much smaller community to draw support from. Aids you with writing components and composing applications. Think of it as the View layer to reflect a Redux store. Transpiling is optional which encourages you to write valid JS. Real HTML with dynamic interpolation including inline event binding. Uses a loose parser and supports class, value, and data-* attributes without issue. A rich transitions API that animates your application and components with ease. Performance and memory management are core to this library. It is built with object recycling to keep memory constant and reduces garbage collection during tight loops. Pretty darn tiny once compressed at 9.9kb minified + gzip. If you are transpiling or not using HTML, you can omit the parser by requiring diffhtml/runtime instead, bringing the size down to 8.5kb! We aim for broad compatibility amongst devices and their various browsers. The output bundles are valid ES5, but may require the Babel polyfill to be loaded in unsupported browsers. diffHTML uses many modern browser features, such as Set, which are not available in all browsers. If you wish to use diffHTML in older browsers, make sure you have the Babel polyfill loaded first. The Virtual Element object is much lighter than its respective DOM Node, as it represents only: rawNodeName, nodeName, nodeValue, key, attributes, childNodes. Contrast this to the hundreds of properties and methods on a real DOM Node. Also note that Virtual Trees contain no circular references. Two attributes that may stand out to you, rawNodeName and key, are necessary for making optimizations and enforcing correctness during the synchronization stage. The first is used to reference the exact casing as written, as nodeName is always lowercased. The key is used for sibling elements when you want to have precise control over which elements are added, moved, and removed. You can create Virtual Elements using the API method: createElement. You may wonder what the difference is between using the raw object and calling createAttribute. The main difference is that using createAttribute will pull from the object pooling system. This is much more efficient. This shows markup being embedded directly into the component. Note this isn't exactly HTML per-se, but a similar flavor that leans closer to strict XHTML than HTML. It also deals purely with properties and not attributes. This is fairly far and away from standards and to use JSX effectively you'll need to align your tooling around it. What makes this approach great is that it follows a common, existing, pattern. This puts it in harmony with other frontend libraries like: VueJS and choo. Middleware in diffHTML are just a collection of closures. They run in order and whenever a return value is found, it is assumed to be a function and is pushed into an array for the next render stage. It is recommended to use arrow functions, since they are significantly cleaner looking when nested. Register middleware by invoking the use method. The return value of invoking the use method is an unsubscribe function. When you invoke this, it will remove the middleware from being invoked during renders. It will also invoke the unsubscribe method on the middleware function object, if it exists. A useful middleware for gaining insight into your renders. 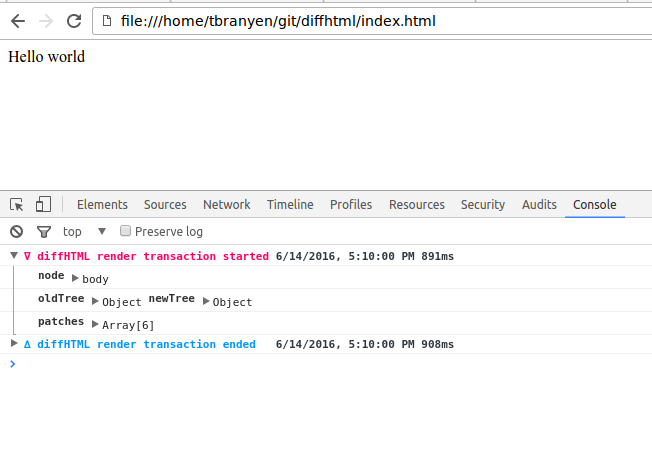 Provides relevant logs for the start and end of each render transaction. This middleware makes it possible to treat diffHTML transition hooks like you would DOM Events when using the tagged template helper. This Babel transform optimizes your render tree by parsing the markdown at build time instead of runtime.